If you’re going to make me a salad, it better be a damn good salad. After all, you’re asking me to skip carbs and satisfying fried finger foods, I might resent you if it isn’t a really good salad. 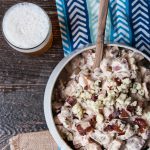 Bacon is a good start, and so is beer. Scallops are a fan favorite as well. Let’s talk about those for a second while we’re at it. 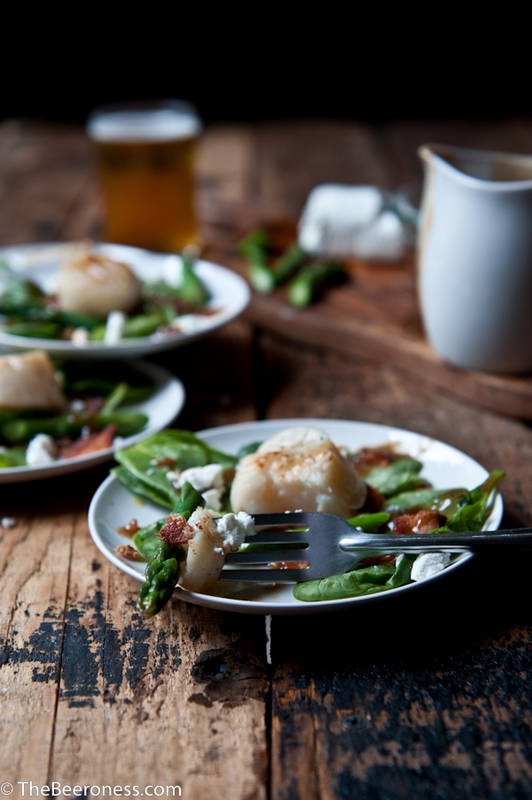 Scallops will most likely come to you via a grocery store seafood counter soaking in a milky phosphate solution (yum!) that will help keep it fresh longer as well as give it an unfortunate soapy taste and an inability to sear properly. The solution to this is beer. Well, more accurately, a brine. Soaking the scallops in a brine will flush out that unappetizing liquid and give you a great taste and a great sear. Which will help that salad taste amazing. And make people forget all about the missing french fries. But there is beer and bacon and perfect scallops, so no one should complain. If they do, take away their beer. In a large bowl stir together the pale ale, salt, water and lemon juice. Add the scallops, cover and refrigerate for 1 hour. Remove the scallops from fridge and place on top of a stack of 4-5 paper towels. Add another layer of paper towels and allow to drain and dry for 15 minutes. Sprinkle with pepper on both sides. Cook the bacon in a pan over medium high heat until cooked through, remove from pan, chop and set aside. Add the shallots to the bacon grease, cook until shallots have softened, about 5 minutes. Add the stout beer, scraping to deglaze the pan. Add the mustard, honey and pepper, whisking to combine. Slowly whisk in the olive oil, stirring until thickened. Remove from heat. Melt the butter in a skillet over medium high heat until very hot. Add the scallops, flat side down, and allow to cook until a dark golden brown crust forms on the bottom, about 2 minutes. Flip and cook until seared on the opposite side. Remove from pan when a slight hint of translucent pink still remains at the center, don’t over cook. Trim asparagus, cut into 2 inch pieces. Cook the asparagus in lightly salted boiling water for one minute, drain and allow to dry. 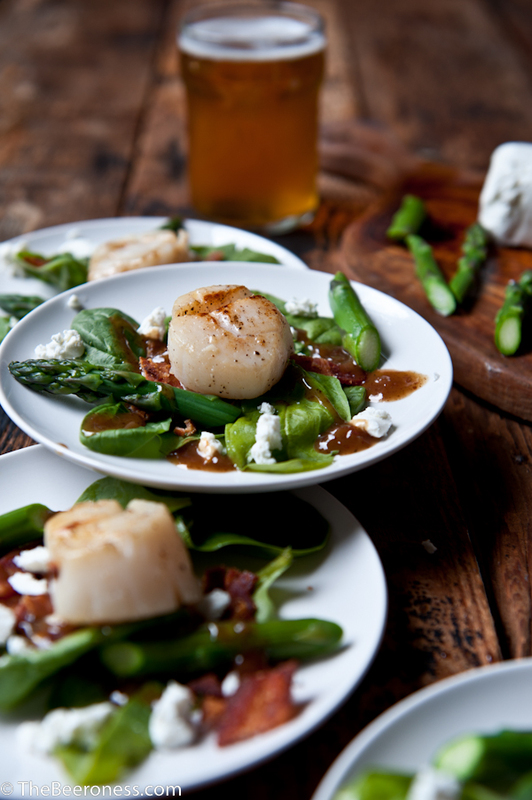 Plate the spinach, top with asparagus, goat cheese, and crumbled bacon, dizzle with dressing, top with scallops. Perhaps this is why I have never liked scallops – the weird soapy solution flavor. 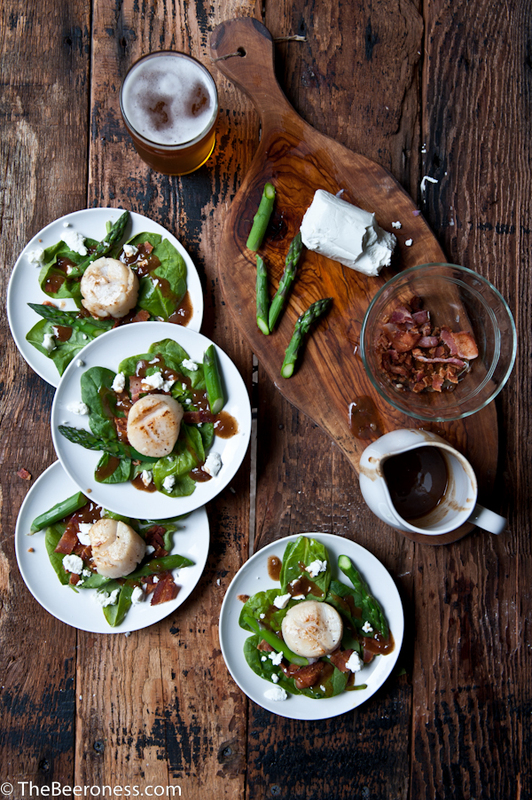 Bacon stout dressing and beer brined scallops?? Wow, that right there sounds just awesome! Seriously this is the craziest (in a seriously DELICIOUS way!) 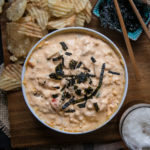 sounding recipe and I bet it tastes darn good too!! Wow!! What an incredible mix of flavours! First time making scallops…and I have to say…amazing….simply amazing! Must have been the brine…the scallops were restaurant quality! Made this as part of a surf n turf with your recipe for Beer Marinated Steak with Porter Gorgonzola Butter… talk about melt in your mouth delicious! Incredibly moist and tender.And again…the flavours were amazing!! Received the best ever compliment…was told it tasted just like were sitting in New Orleans (Best food EVER on that vacation). Thanks for your awesome recipes!! This sounds great! 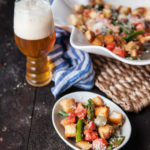 What kind of beer do you suggest pairing with this dish–stout? No, I’d pair something with the scallops rather than the dressing but something that can hold up to the dressing. Maybe a saison or a bier de grade. 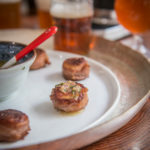 Just made brined my scallops with an IPA, wrapped them in partially cooked bacon and baked them for 12-15 minutes at 425 …excellent! The bacon did not overwhelm the scallops. Thanks, Jackie!